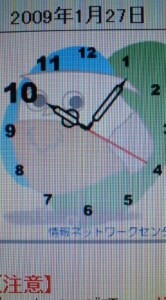 In modern Japan, it is common for people to possess an owl of some sort. Not a real-live one, of course, but perhaps a figurine, doll, painting, stuffed animal or even just a cartoon image of these instantly recognizable, flat faced birds. In fact at the library, I found a whole book dedicated exclusively to the different owl-shaped folk figurines produced in the various regions of Japan. These owls are usually kept at home, but I personally know several Japanese who ALWAYS carry little owl figures with them, in the same manner as I remember how some Americans always have a rabbit’s foot in their pocket. The reason for this can be found in the Japanese name for OWL – FUKURO （フクロウ or 梟) – which can also be written with different KANJI CHARACTERS that give it a LUCKY significance. FUKURO can be written as 福来郎 （福: fuku, LUCK; 来: kuru, comes; 郎: ro, suffix for a boy’s name), meaning LUCK COMES, or as 不苦労　(不: fu, no; 苦労: kurou, hardship), meaning NO HARDSHIP OR SUFFERING. 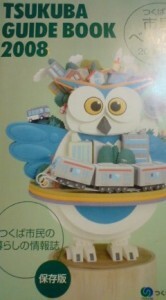 This type of word play which can make the names of objects either auspicious, or inauspicious is called GORO AWASE (語呂合わせ), and in this way, owls have come to be one of the more popular motifs for ENGI MONO, or lucky charms, and those who are interested can find in certain books or magazines, detailed explanations of how owl figurines of various shapes, sizes, and colors have different types of luck-bringing power. 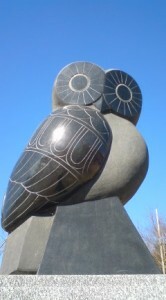 For Westerners, it is not surprising that the owl was chosen to be the official bird of our academically oriented city, as for us, it is the familiar symbol of wisdom. Since the Meiji Period (beginning in 1868) the Japanese, too, have adopted this view of owls being the philosophers of the forest, and the symbol of knowledge and technology. This notion gradually evolved in Europe because of the bird’s association with the Greek goddess Athena, who as the protector of Athens went from being an agricultural goddess (owls eat plenty of mice! ), to goddess of war and eventually to being associated with the learning and arts which thrived in her great city. 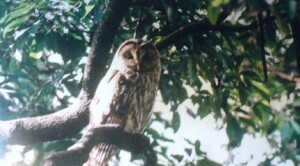 Before Japan opened up to the West, letting in this new symbolic significance for owls, it was classical Chinese texts, which described these nocturnal birds as bad omens or even evil creatures (at one point in Chinese history owls were nailed ALIVE to trees on the summer solstice day, because it was said that they ate their parents and were thus highly unfilial birds!) that influenced how the Japanese viewed them. Being mysterious creatures of the night, whose calls were often loud and frightening, reinforced this negative image. At best, the owls were believed to be predictors of the weather, and a look at any encyclopedia of Japanese folk beliefs will show how various conflicting interpretations of the owls hooting developed in different parts of Japan in relation to the next day’s weather. Anyway, these beliefs are now mostly a thing of the past as the Western view of the owl has taken firm hold. 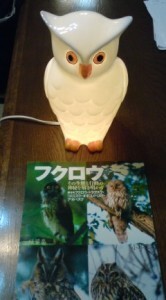 Another reason for the owl having been selected as Tsukuba’s official bird cannot be easily guessed anymore. 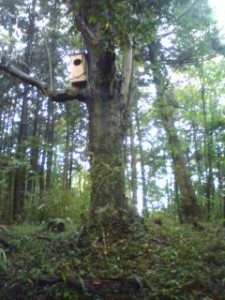 The once abundant forests, which provided shelter and nesting possibilities, and the many wide open turf-grass fields, which make perfect hunting grounds (owls love mice and moles) made Tsukuba an IDEAL PLACE for owls to make their home. Still in my neighborhood of KONDA, we can be awakened at night by the hooting and screeching of owls, and we can often seen them waiting for a meal or a mate, in the twilight, on utility poles and telephone wires. In other parts of Tsukuba and Ibaraki, things have not been good for our official bird. Rampant destruction of our woods and what seems like the systematic targeting for elimination of any greenery, has sent surviving owls off to look for new homes. Unfortunate refugees might end up in Tsuchiura where they will very likely get caught in the deadly nets around Kasumigaura. 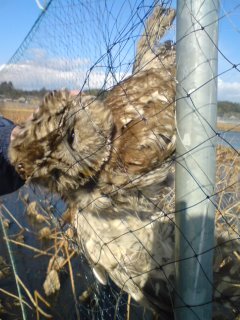 Maurice Gilis, who lives in Iwama, recently found a large Ural Owl, horribly entangled, which died a humiliating upside-down death. We have been reporting the danger of these useless nets for more than a year, but it appears that officials (and most other people) DON’T GIVE A HOOT. It won’t be long before our mascot and official bird will exist only in figurine and cartoon form, in this place where, until just a few years ago, it thrived. 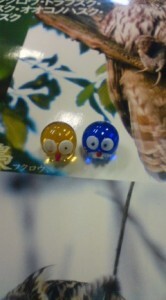 I guess the owl is not REALLY a very lucky bird after all. (one ironic development in relation to this story is that the people who are trying get a road built through certain woods which local residents are trying to protect ( the developers want a nice road which goes straight from their housing complex to Tsukuba Center- to make their real estate more valuable- while activists want to protect the nesting area of goshawks and other birds) have been pushing the idea of creating a FUKURO NO MORI ( Owl woods), and have actually put up some nest boxes which they hope that owls will set up home in.